The recent publication of the ONS reports on Adult Smoking Habits in Great Britain and the Integrated Household Survey results for 2013 brings welcome news on smoking. Adult smoking rates are at their lowest ever, below 19% based on the Integrated Household Survey, and rates are falling across all age groups according to the Opinions and Lifestyle Survey (figure). GPs have collected smoking status data on more than 96% of the registered population, and although it is not regularly updated a reasonable estimate of the smoking population can be made based on a sample size of millions rather than the few thousands involved in the Integrated Household Survey. Honeyford et al recently published a paper outlining the combination of two separate QOF indicators to produce a practice level smoking prevalence estimate and we have used this method to calculate smoking prevalence for each practice. 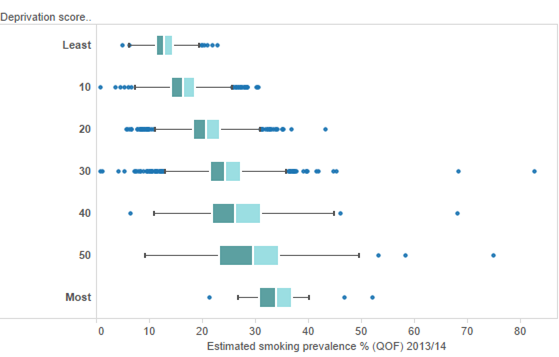 The variation in practice level smoking rates stratified by deprivation score is summarised in the box plot below. These data are included in this year’s refresh of national GP practice profiles. The average smoking prevalence 15+ based on these data is 19.2% for 2013/14 which is consistent with that reported by ONS. As the figure shows there is a steep deprivation gradient in smoking rates varying from a median of 16.4% (in practices with a deprivation score of less than 10) to 34% in practices with a deprivation score greater than 60. Within each deprivation band however there is wide variation in smoking prevalence at practice level. 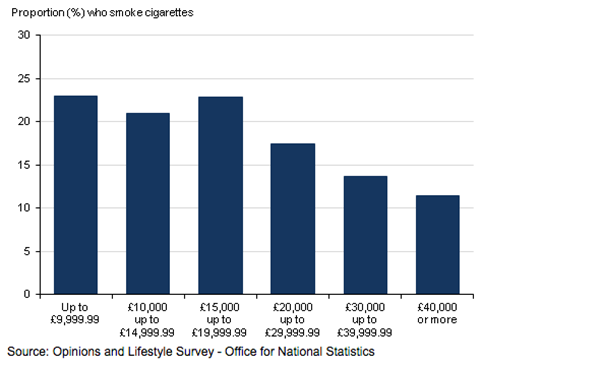 This confirms the picture from ONS that cigarette smoking is strongly associated with poverty (figure). Smoking prevalence among those with incomes under £20,000pa is around 23%, compared with 11% among those earning £40,000pa or more. And smoking prevalence in routine and manual occupations is almost 29% compared with just under 13% among managerial and professional occupations. Despite the overall good news on smoking, significant inequalities persist and a recent PHE blog post by Kevin Fenton highlighted the need to tackle inequalities in smoking and sets out what PHE is doing around this issue. There does seem to be a tendancy in public health/tobacco control circles to concentrate only on the lack of a gateway effect regarding e-cigarettes,even though it is now over 6 years since they were first publicised by the BBC. The more important story from the various recent surveys is the impact they have had on overall prevalence.Combining the results from the various surveys(including those by ASH),it would appear that ecigs are responsible for a fall of between 1-1.5%,enough to bring prevalence below 20% and to meet the DoH target of 18.5%. Given that the percentage of ex-smokers has remained constant for many years - indicating that traditional policies have achieved little more than replacing those ex-smokers who die each year - it would seem perverse not to embrace ecigs as the most likely tool to achieve the 'end-game'. 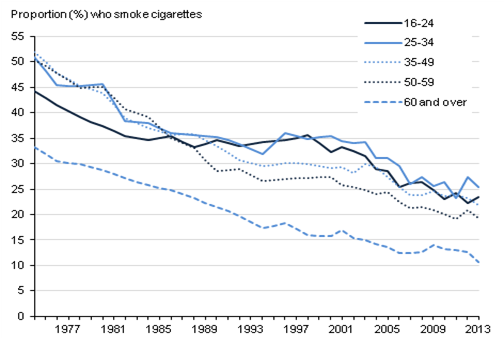 I though the blog was really helpful to outline the prevalence and trends in smoking. It comes as no surprise in regards to inequalities and smoking in areas of greater need, and I suspect it is not just smoking rates. I wondered if we could, once we have identified the inequalities to highlight interventions that may have a success rate. I think the action based research would be most helpful, as information that tells us what we suspect/already my know is helpful but not addressing the underlying cause. Thanks again for the really informative blog.